Materials for Biomedical Engineering: Nanomaterials-Based Drug Delivery highlights the progress made in the field of nanostructures bioactive materials and their impact on efficient drug delivery towards personalized medicine. Drug delivery is a well investigated and challenging bio-medical field, with promising perspectives in medicine and engineering. 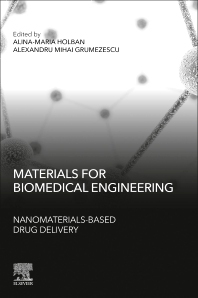 This book brings together the latest research findings regarding nanostructured materials and their potential in designing highly efficient and personalized drug delivery systems. Alina-Maria Holban is a lecturer in Microbiology and Immunology, at the Faculty of Biology, University of Bucharest; and associate researcher at the University Politehnica of Bucharest, Romania. Her primary area of research is the development of bionanomaterials with antimicrobial applications. Dr. Holban has published 75 papers in peer-reviewed journals, 42 conference/symposia proceedings, and has edited more than 21 edited books. Excelente content for the recent progress in the field. Could have a beauthier cover.